Ok, I've had an early lunch and I'm off to visit the other office. As always, I'm already hungry for my early afternoon snack, but seeing as how I'm trying to resist the urge to head to DQ and grab a 600 calorie treat, I've convinced myself to go visit the freezer aisle of walmart. The selection varies from store to store, but hopefully I can find something decent. Wait, what's this? 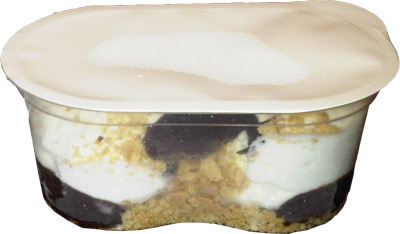 A Great Value S'mores dessert cup? Looks like ice cream! 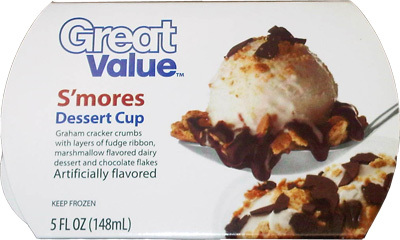 It says Graham cracker crumbs with layers of fudge ribbon, marshmallow flavored dairy dessert and chocolate flakes. Well, it's certainly an interesting sounding combo, and this side view makes it all the more tempting. Let's check the nutrition: 190 total calories, 8% of my fat (14% sat fat), and a mere 88 cents. Sounds like we have a winner! Wow, it smells like angel food cake, and it looks pretty funky too, very whipped. I think they are using the term "chocolate flakes" pretty liberally here. We've got one giant flake up top there, and a small flake next to it. No matter, I'm going in! I'm trying the marshmallow flavored dairy dessert first. It's very sweet, very airy, and I taste, uh oh.... sucralose!! Oh I despise artificial sweeteners! It's a lot like eating frozen whip cream with an artificial tinged aftertaste. Ewww, yucky yucky aftertaste! Ok, biting the whole treat this time. I like the thought of graham crackers and the execution here is decent. Unfortunately they seem a little soggy(fluffy) from being so loosely packed. In my mind they could have easily doubled up on them. Chocolate is low quality ofcourse, but it's not awful. hehehehe, I just ate the giant flake, it was tasty! you know, overall, this ain't a bad idea at all. 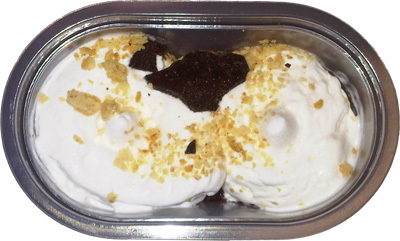 It's not exactly executed well at a mere 88 cents, but part of me is enjoying scooping the graham cracker crumbs up from the bottom with a fork full of faux ice cream and chocolate sauce. Once the ingredients got mixed they kind of countered out their low quality and even the aftertaste is improved (though still lingering). Bummer, it's all gone and I could probably easily shove in about 2 more of these treats. Try the birthday cake too, it's not so bad :) You just might have to eat two! oh really? funky! the only other flavor this store had was key lime pie.